CASTER SEMENYA became only the third female athlete to win the 800-1500m double gold at the Commonwealth Games, racing to victory in her specialist two-lap event on Friday in a time of 1:56.68. World record breaker Caster Semenya at the Commonwealth Games. South Africa’s greatest female track athlete ever added the 800m gold to the 1500m title she won earlier in the week. She was never bothered in her two-lap race, leading from start to finish going through the bell in 58.66 seconds. Perennial challenger Margaret Wambui of Kenya finished second in 1:58.07 with Jamaican Natoya Goule rounding off the podium in 1:58.82. Semenya won her first major 1500m title in style on Tuesday when she broke Zola Budd’s 34-year-old record with a time of 4:00.71. The 27-year-old follows in the footsteps of Kenyan Lancy Langat and Welshwoman Kirsty Wade, who won both the 800m and 1500m titles at the 2010 Delhi Games and in Edinburgh 1986 respectively. 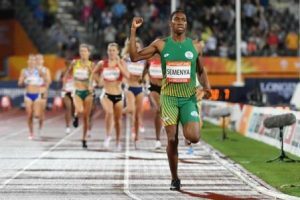 Semenya claimed a rare 800-1500m gold-bronze double at last year’s global championships in London repeating Russia’s Svetlana Masterkova feat from Seville 1999.